Summary: Learn how to make repairs to flashing, repair cracks and small holes in flashing, repair flashing mortar joints and replace damaged flashing. Where one part of the roof meets another part or where the roof buts onto a wall, the joints are weatherproofed with ‘flashing'. There are different types of flashing for different types of joint. Flashing comes in several materials: lead, zinc and bitumen (used on felted roofs). Lead is the best material to use as it weathers extremely well and can be used on all types of roof. Zinc is less expensive but does not last as long as lead, and can be difficult to work. Fine cracks in flashing can be repaired by injecting a bituminous sealant into them with an applicator gun. Large cracks and small holes will need to be patched with a self-adhesive metal-backed flashing-strip. Clear away debris from the area with a wire brush. Use an abrasive paper to rub over the surface and wipe clean with a damp cloth and leave to dry. With a paintbrush apply flashing-strip primer over the damaged area, spreading it beyond the damaged area by 50mm (2in). Allow the primer to dry for 30 minutes or for as long as stated by the primer's manufacturer. Use a knife or a pair of scissors to cut a piece of self-adhesive flashing-strip that will cover the whole primed area, and peel off the backing strip. Place the strip over the primed area and press firmly into position. Use a wallpaper seam roller to produce a smooth finish. With a paintbrush apply flashing-strip primer over the damaged area and 50mm beyond. 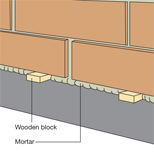 When flashing is fixed in place its top edge will be fitted into the mortar between two courses of bricks. The flashing can sometimes work loose at this point and water can penetrate under the flashing and into the mortar joint. Push the edge of the flashing back into the mortar joint between the two courses of bricks. If the flashing springs back, wedge it in place with small pieces of wood. Re-point the joint using a general-purpose mortar mix: 1 cement: 1 lime: 5 sand. When the mortar has hardened, carefully prise out the small wooden wedges and fill the holes with mortar. If the flashing springs back after being pushed into the mortar joint, wedge it in place with small pieces of wood. If an area of flashing is badly damaged or corroded it should be removed and replaced with self-adhesive metal-backed flashing strip, which, unlike lead flashing, is not fitted into mortar joints between courses of bricks. 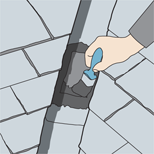 Use a plugging chisel and hammer to loosen and remove the mortar holding the damaged flashing in place. 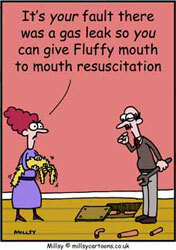 Wear gloves and protective goggles. Pull away the damaged flashing. Use a wire brush to clean away dust and dirt from the area to be repaired. Re-point the joint between the two courses of bricks. Allow the mortar to dry for approximately 12 hours. Apply flashing primer over the area of wall and roof where the flashing has been removed. Allow the primer to dry for 30 minutes or for the length of time stated by the primer's manufacturer. Cut two lengths of flashing strip long enough to cover the area that needs to be sealed. 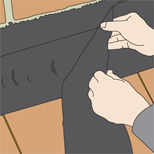 Peel off the backing paper from one length of flashing strip and position it in place so it overlaps the roof and wall/chimney stack by an equal amount. Apply even pressure with a wallpaper seam roller to make sure the flashing strip is well stuck down. If your repair takes in an internal corner, make a small cut in the lower edge of the strip, overlapping the cut edges. If your repair takes in an external corner, cut a square patch to fit over the corner. 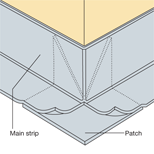 The square patch must be fitted before the main strip. Make a cut from one corner to the centre of the square patch. Position the patch so that the cut runs up the wall over the corner and splays the patch on either side of the corner in a ‘V' shape. Position the flashing strip and make a cut in the corner on the bottom edge where it corresponds with the position of the corner. At this point trim off any excess from the flashing strip. Remove the backing from the second piece of flashing strip and fix it in position, overlapping the first strip but with its top edge 50mm (2in) above the top edge of the first strip. Again smooth over the repaired area with a wallpaper seam roller. Use two lengths of flashing strip positioned in place so they overlap the roof and wall/chimney stack by an equal amount. 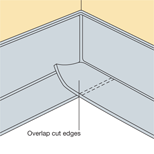 For internal corners, make a small cut in the lower edge of the strip, overlapping the cut edges. For external corners, cut a square patch to fit over the corner. The square patch must be fitted before the main strip as shown.